Lil' Bit is the newest addition to Wood Gems in Kingman, Arizona. 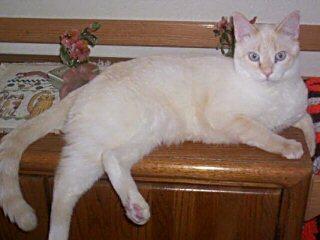 "Within a month [after Fetchit died] we adopted a tiny little Flame Point kitten from the Las Vegas Humane Society and named him LilBit 'cause he was just that. Boy has that changed. He'll be a year old about April 1st  and he really keeps his buddies Cheezit (11) and Midget (9) in line, but they have more life in them than ever before and they all play like they were one year old like him - it's great! 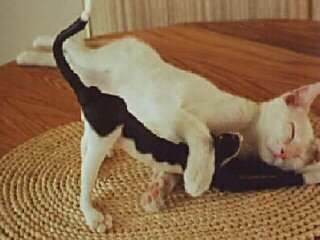 They even "fetch" like they used to do when they were kittens. 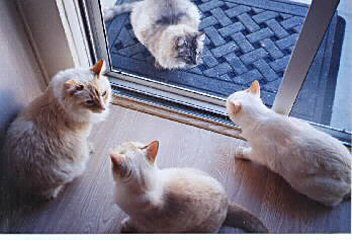 We're keeping with our tradition since 1971 of having nothing but male Flame Point Siamese and LilBit makes the ninth one we've adopted from an agency." Story and pictures sent in by Stew & Peggie Evans of Kingman, AZ. copyright ©1998-2003. All text and photographs are copyrighted by Trina and Greg Samson unless otherwise indicated. If you are interested in using something from my site, please write to ask permission first.